TechCrunch readers may be familiar with Uber, the on-demand cab/private car service that lets users bypass the annoying process of waiting for cabs or expensive prospect of renting a limo — all via your mobile device and SMS. GroundLink, the New York City-based car service that was founded in 2003 as an aggregator and solutions provider to the ground travel industry, is going mobile today to enable users to book a private car whenever they want — either immediately or at a scheduled time — via their smartphone on iOS and Android. With its new on-demand mobile functionality, GroundLink aims to offer an attractive alternative to other metro car and cab services by offering full transparency into price before a user books their ride, as opposed to getting hit with a daunting bill once the ride is finished. GroundLink wants to take hidden fees and long waits out of the equation (a big problem for anyone who’s tried using similar services in NYC), and hike up the transparency by offering flat rates solely based on distance rather than competitors which include traffic (via measuring speed) in their pricing schemes, often resulting in sharp price hikes thanks to fun things like gridlock and toll traffic. Is there really any time in transit to or from New York City (or San Francisco for that matter) where one doesn’t have to deal with traffic? What’s more, according to GroundLink CEO, Charlie Fraas, the service has “ten times more cars in their NYC fleet” than other competitors offering this on-demand mobile functionality seeing as it’s already an established name in NYC. And, as availability is generally the top concern when booking a car on-demand via mobile, GroundLink offers a great value proposition seeing as it’s already available in 5,000 cities and 110 countries around the globe. Registered GroundLink users can take advantage of its mobile, location-based “Ride Now” function to order cars in realtime (on-demand) via GroundLink’s apps, or book in advance with “Ride Later”, which lets one set a specific date, time, and location for pickup. In each case (like Uber), riders can track their car’s location (in conjunction with its exact arrival time) and communicate directly with drivers at any point during the process. This feature is launching today in New York City, and depending on results, will launch worldwide sometime in the near future. The mobile service also offers a social sharing tool so that riders can update friends and followers during the duration of their trip, and leave reviews and recommendations for good drivers and not-so-good drivers. To celebrate the launch of “Ride Now” in NYC, GroundLink is offering customers who book through ots iPhone or Android apps the chance to win more than $15,000 in cash and other prizes. Starting today, GroundLink’s fleet will be stacked with a variety of prizes for five days, including two envelopes containing $1,000 in cash each day. Other prizes include tickets to Yankees, Giants, and Jets games, Momofuku and Peter Luger gift cards, Brooklyn Bowl, Barneys and Tiffany gift cards, etc. 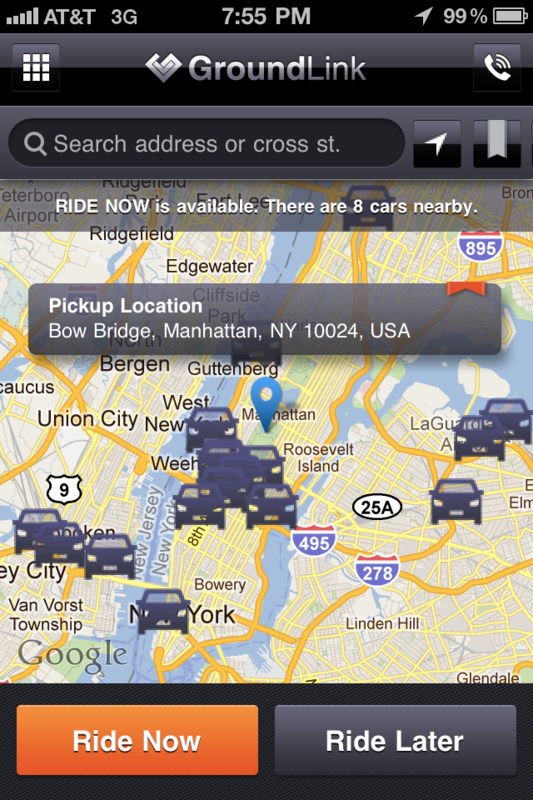 “GroundLink is much more than an app”, said the GroundLink CEO. “We are the first company to deliver access to a global fleet of more than a hundred thousand cars through an app. Until now, business travelers had no way to find a reliable and competitively priced private car service around the country and the globe. With the launch of our mobile apps on iPhone and Android, we’re embracing a multi-platform business model that is unique in our industry”, he said. For more on GroundLink, check them out at home here.